The darling of the teenage BlackBerry-toting masses, BlackBerry Messenger, is coming to Android - and we have what we're told are the first screenshots of BBM for Android for your delectation. Until now, there hasn't been much meat to the rumour that RIM is bringing out Messenger apps for Android and iOS, but these photos apparently come by way of a RIM employee who tells us that the app is in the final stages of testing, with BBM for Android launching by 2012. 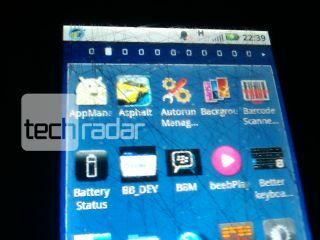 Update: We might have been had here, people - as commenter Benjymous points out, one of the images was likely taken from RIM's BlackBerry Dev Blog. The screenshots show the BBM icon on an Android menu screen and a contact profile page from the beta version of the app.The icon looks a little squat to us, but it's not a final version of the software so it's possible that this is just a placeholder for now. The contact profile page is not exactly a looker, but it offers all the details you'd expect - messaging and contact book icons at the bottom of the page and the contact's name, picture, PIN and availability status shown. We can't be sure, but we'd imagine there's a threaded conversation style page also available when you get into the nitty gritty of the messaging service - and presumably you can message friends on BlackBerries as well as other BBM for Android users. There isn't a great deal of solid information to be gleaned from the images, but our source also tells us that the app works well with Android's push notifications. The images give no clues as to whether RIM's recent upgrades to the messaging service, like BBM Music and in-app chat integration, will be included as part of the launch version of the app, unfortunately. It's no secret that RIM has been beefing up BlackBerry Messenger, particularly since Apple announced that iOS 5 will bring its own private messaging app, iMessage, to the iPhone. As well as BBM for Android, we expect to see BBM for iOS launching at some point too – although, with iMessage on the horizon, who knows if the app will get through Apple's App Store approval. As far as the screengrabs go, there's no real way for us to verify them until BBM for Android launches so it's possible that someone is giving our leg a good yank - but with the app almost certainly in development, we're cautiously optimistic about the whole thing being legit.